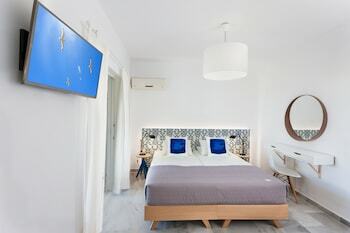 Located in Zakynthos, Galatea is by the sea, a 4-minute drive from Psarou Beach and 8 minutes from Amboula Beach. Featured amenities include luggage storage and laundry facilities. Free self parking is available onsite. When you stay at Casa Di Mare Voula in Sitia, you'll be near the beach, within a 15-minute drive of Vai Palm Grove and Toplou Monastery. Free self parking is available onsite. With a stay at Kipseli Hotel in Volos (Volos City Centre), you'll be within a 5-minute walk of Volos Port and Volos Town Hall. Featured amenities include a 24-hour front desk and an elevator (lift). Located in Serifos, Albatross Hotel is by the sea, a 3-minute drive from Livadakia Beach and 9 minutes from Chora Wildlife Refuge. Featured amenities include luggage storage and laundry facilities.